Nissan makes vehicles known for doing things differently, for creating ripples in a placid pool that often is the automotive industry. Like the bold Nissan Frontier or the sleek Nissan Maxima, both of which are parts of very different vehicle classes and equally as enjoyable in the fun department. But there are few vehicles more thrilling than the Nissan 370Z Roadster. It offers the same exhilarating performance from its derivative vehicle, but with the fun and freedom of a convertible coupe. 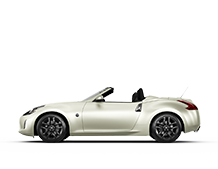 Take a look and learn more about the newest Nissan 370Z Roadster, here at West End Nissan! Even just at a glance, it’s clear the Nissan 370Z Roadster is something special. Its unique design is aided by a contrasting colour scheme that accents the side mirrors, underskirt, and even inside the wide-spoked rims.—it’s truly unlike any other. 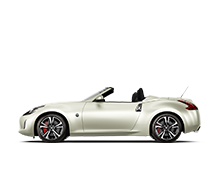 The 2019 Nissan 370Z Roadster is one of the most powerful vehicles, clocking in with 332 horsepower and 270 lb-ft of torque. Along with head and tail lights inspired by the original, the 370Z Roadster evokes a fierce view from the front and a beautiful look from the back, with muscular accent lines throughout the midsection. There is no vehicle quite like this on Edmonton roads, though many have tried, none have captured uniqueness like the 370Z Roadster. Much like its derivative model, the Nissan 370Z remains largely the same in 2019, with slight variations and updates for the new year. The Touring Sport trim consolidates both the Touring and Touring Sport trim levels to give you a more streamlined 370Z model with the best of both worlds. Meanwhile, both the auto-dimming mirror and rear camera both come standard with the base-level model to make it a safer experience while the adrenaline is pumping. Lastly, unlike the original 370Z, the 6-speed manual transmission on the 370Z Roadster is still available to let you experience the seamless and smooth speeds possible while on the road. West End Nissan is your go-to dealership for researching and comparing Nissan models. Contact our sales, service, parts and financing departments for help in any area.